OPEN BAR FOR THE FIRST HOUR! 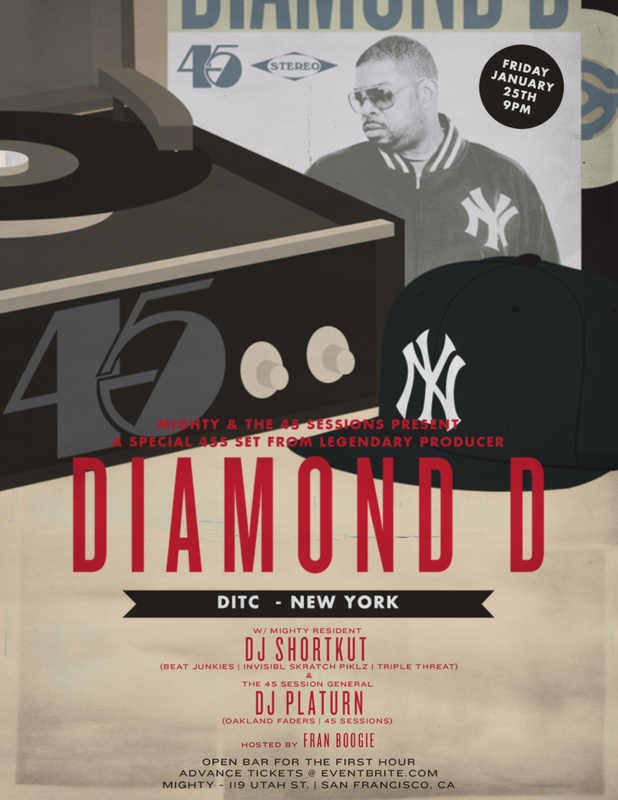 MIGHTY, in association w/ the 45 Sessions, is happy to present a special DJ set by NYC Legendary/Grammy winning music producer, Diamond D. Support from DJ Shortkut & DJ Platurn, hosted by Fran Boogie. Open bar first hour. Ticket’s available at eventbrite.com. Veteran hip-hop producer Diamond D has helped out with several of rap music’s most acclaimed LPs, including A Tribe Called Quest’s The Low End Theory and the Fugees’ The Score. In 1992, he recorded his first solo album, the underground classic Stunts, Blunts & Hip-Hop. Although it never sold very many copies, it increased his status, and he worked with Illegal, House of Pain, KRS-One, and the Pharcyde during the mid-’90s. A host of top-flight rappers returned the favor for his sophomore album, Hatred, Passion & Infidelity, including Busta Rhymes, Phife Dawg (A Tribe Called Quest), and Pete Rock. When it comes to spinning 45s, amongst “heads”, Diamond D is known for that. There aren’t many others that compare. Peep some footage below.